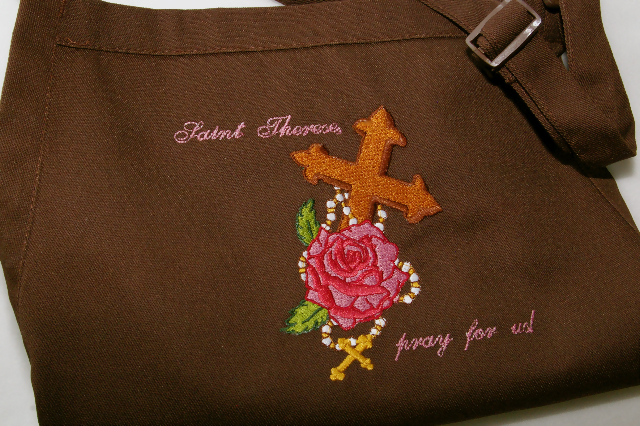 Catholic Cuisine: The Winner of the St. Therese Apron is. . . 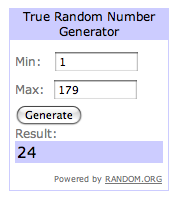 The Winner of the St. Therese Apron is. . .
After saying a little prayer to St. Therese, asking her to help me choose the person to whom she would like to send this little "rose," and then clicking the number generator, the winning comment came up as #24, Bethany Hudson, from The Apple Cider Mill. Clicking over to her blog, I loved that her last post was actually in honor of St. Therese! How appropriate! Please email me at catholiccuisine[at]gmail[dot]com with your shipping information, and I will forward it on to Catholic Embroidery. For those of you that didn't win, you can still purchase a beautiful Catholic Apron on our Apron Page or in the right sidebar! I just updated the page with some new revisions that Catholic Embroidery made on a few of the aprons, making them even lovelier! Be sure to keep them in mind, as they would all make wonderful Christmas gifts! Thank you all for your participation! I could hardly believe the response, as the comments started flooding my inbox from the minute I published the post. It was so nice to hear from you all! Congratulations to Bethany, and thank you for giving the rest of us the chance to participate! These aprons are quite lovely. WOW "24" that's how many years St. Therese lived on earth ! ya for Bethany. the aprons are so beautiful. thanks for the opportunity to win. The 2011 Saint-O-Lantern Link Up! Soul Cakes: The Original Halloween "Treat"